Five rare early English Catholic a cappella votive antiphons from Blue Heron’s Gramophone Classical Music award-winning wowed a capacity crowd on Saturday night in First Church Cambridge. Less than a single file cabinet drawer of original music manuscripts survives from the decades preceding Henry VIII’s purge of England’s Catholic patrimony. The restoration of these and other related Latin-language works result from Nick Sandon’s lifetime of careful scholarly reconstruction. Heron’s three recent performances in Ashmont, Cambridge, New York City prepared for its runout to Manhattan’s Corpus Christi Church, reviewed HERE in The New York Times. 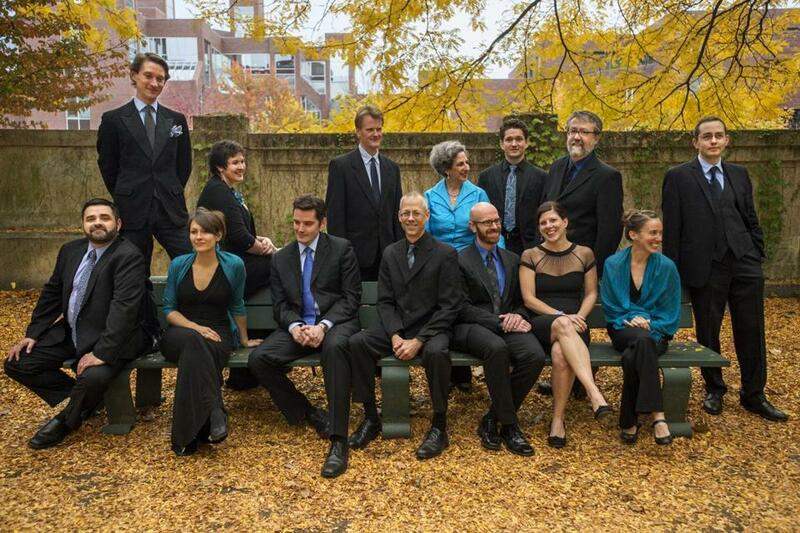 Under the able direction of Scott Metcalfe, Blue Heron has expanded from its debut in 1999 to a world-renowned professional vocal ensemble of up to 13 singers, specializing in lesser-known Renaissance vocal music. The ensemble, now standing at the halfway point in its series honoring Johannes Ockeghem (c1410-1497), has presented and recorded five CDs from Cambridge’s Peterhouse Partbooks, replete with comprehensive historical notes in editions completed Sandon, HERE. Saturday’s concert began with the large-scale Marian antiphon O Albane deo grate (Antico Edition, RCM 58) by Robert Fayrfax (1464–1521), based on the same cantus firmus as Fayrfax’s Missa Albanus, and later re-texted as O Maria deo grata. The 15-minute-long work addresses St. Alban, venerated as the first British Christian martyr. Scott Metcalfe illustrated the structure of the five-voiced work by asking his singers to perform each entry of the cantus firmus theme, at pitch and in order, to show how Fayrfax created a work of subtly and density from fewer than a dozen tones. Treble and tenor parts are largely contributed by Sandon, and Mean (Alto), Contratenor, and Bass parts are from the original. The modern edition transposes the key from the original F major to the modern D major: this results in a very dark tessitura for basses Paul Guttry, David McFerrin, and Steven Hrycelak, more closely matching the lower pitch of the early Renaissance cathedral organs in England. Some 17th-century reports describe English cathedral organs as sounding as much as five half steps lower than secular keyboards used in the same city. See HERE for the first page of the score. FCC provided several seconds of reverberation, rounding out the choral sound. Since the kind of Latin votive antiphons we heard usually originated from small side chapels (or perhaps even in the more resonant basement chapels at Canterbury), the sound was much less intimate than the original composers intended. However, the balance of voices (three well-matched sopranos, Sonja DuToit Tengblad, Brenna Wells, and Shari Alise Wilson served in place of a bouchoir), the delicate interwoven polyphonic textures plunged the audience back several centuries into the world of the pre-Henrican Catholic Church. John Taverner’s syllabic miniature O Willelme, pastor bone and a strange, but beautiful Ave gratia plena Maria [sic], stands as the only surviving example of music from Arthur Chamberlayne (b. 1470s), who may have been a singer at Magdalen College, Oxford. O Willelme honors St. William, Archbishop of York (d. 1154) and Cardinal Thomas Wolsey, Archbishop of York (“Watch over our particular founder, Thomas the cardinal”). From 1526-30, Taverner (c1490-1545) served as the master of the choirboys at Cardinal College, Oxford, founded by Wolsey. The college statutes required a daily devotion to St. William (“O William, good shepherd, father and defender of the clergy”), so this combination of texts could have been sung up to 1529, when Wolsey fell out of favor with Henry VIII: but this music survives in other sources, re-texted as O Christe Jesu, in honor of Christ and Henry. This short piece pre-dates the simple, homophonic (Anglican) anthems of Tallis and Byrd, and may have provided a model for simpler text setting. Taverner’s music was partly written for singers at Cardinal College (they had 28 paid singers at one time), but this music showcased Blue Heron’s smaller group of 13. Although the soprano group entered at a sightly lower pitch than the other four sections at times, the ensemble demonstrated the best blend of the evening in this short piece, supporting long melodic contours with a slightly brighter tone to clarify contrapuntal moments. See HERE for Taverner’s Small Devotion, based on the same antiphon. A parody Mass Gloria (Kyries were not usually set polyphonically in English Catholic practice). This shares very little text with the standard Ave maria, but the virtuosic choral pairings (sometimes called “the English style”), the trios (esp. of the seven lower voices in three lower parts), and the sheer beauty of the vocal lines grow to several climaxes over the course of the work. The combinations of parts are sometimes unusual, with one haunting section contrasting soprano with the two lowest male parts. See here for the first page of Chamberlain’s music, with the tenor provided by the editor, HERE. The second half contrasted O baptista vates Christi by Hugh Aston (c1485–1558) with the dramatic and varied Salve regina by Nicholas Ludford (1490-1557). Aston’s text is a Latin antiphon in ten stanzas honoring St. John (a saint rarely honored by English composers), with references to the singers themselves (“Quem pulsamus in hac ede Consonoris vocibus / whom we address in this shrine with concordant voices”). Thomas Wolsey invited the composer to establish the choir at Cardinal College in 1525, but he deferred to John Tavener. A gifted craftman of imitative counterpoint, he served as the choirmaster in Leicester for more than twenty years (until St. Mary Newmarke College was dissolved in 1548). This work showed off the supple unisons achieved by Jennifer Ashe, Pamela Dellal, and Martin Near singing Mean (alto), and this edition frequently sets the two tenor parts in opposition and contrast to each other (sung by Philippe Gagné and Mark Sprinkle contratenors and Michael Barrett Jason McStoots, tenors). This edition transposes the manuscript up one whole step (from C to D) and retains the original Mean, Contratenor, and Bass parts; look HERE for the first page. The only example of music from the capital, Ludford’s magnificent Salve regina provided the closer. Ludford directed the music for St. Stephen’s Chapel in the palace of Westminster for two dozen years (until its dissolution in 1947). English settings of this and other Marian texts usually include three rhymed stanzas inserted between phrases at the end of the antiphon: this five-voiced a cappella work follows the standard Latin Salve regina with Latin texts, accompanied in the program by a contemporaneous English translation from This Prymer in Englyshe and in Laten, (London, 1537). Unto the father and the sonne. O mercyfull. “Virgo clemens, virgo pia, Virgo dulcis, O Maria, Exaudi preces omnium Ad te pie clamancium. O pia. / Virgin mercifull, virgin holy. O swete virgin, o blessed Mary, Heare theyr prayers gracyously Whiche crye and call unto thee. O holy. Funde preces tuo nato Crucifixo, vulnerato, Et pro nobis flagellato, Spinis puncto, felle potato. O dulcis Maria, salve. / Praye for us unto thy sonne, Wounded and crucified for us all, And sore turmented with flagellation Crowned with thorne, & fedde with gall. O swete Mary, [hayle]. How many voices should sing this music? Sandon’s and Metcalfe’s research has clarified this situation after Henry VIII dissolved nearly a dozen great monastic cathedrals in 1539-40: “Most [cathedrals] were refounded as secular (i.e. non-monastic) institutions which were subject to a bishop and thence to the king, who had declared himself head of the Church of England. New foundation cathedrals aspired to more pomp and circumstance and so they needed to hire a choir of professional singers and to recruit and train choirboys. By the late summer of 1540 Canterbury Cathedral had assembled a roster of 10 ‘queresters’ (boy choristers), their master, and 12 vicars-choral (adult professionals). Thomas Tallis is listed first of the “vyccars,” John Bull sixth.” Bull brought more than five dozen polyphonic works with him from Oxford, added several more to the collection after arriving in Canterbury: this music survived until 1547, when Protestant reformers swept through church libraries, destroying and repurposing more the 90% of the manuscripts and music they found. Johan Bale’s “The laboryouse Journey & serche of Johan Leylande for Englandes Antiquitees” (1549) describing sheet music and pages of part-song books being used to rub boots, scour candlesticks, and stock privies. Blue Heron, which enjoys a loyal local following, will conclude its 2018-19 season with the ninth concert in its Ockeghem series (March 9th in Cambridge, repeated March 10th in Providence), and a multi-media and multi-harp version of Guillaume de Machaut’s medieval gem Remede de Fortune on April 26th-27th. 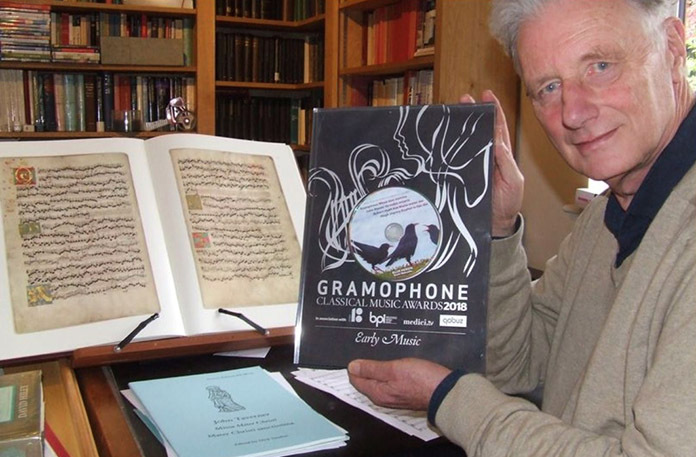 The first non-European ensemble to win Gramophone’s prestigious award for best recording of early music (for the fifth disc, in 2018), it presented selections from its recordings two years ago in Peterhouse and Trinity College, Cambridge and in Lambeth Palace, Canterbury; the group is to be featured at major early music festivals around the world. Laura Prichard teaches throughout the Boston area as a certified K-12 teacher of music/dance/art, as a theater pianist (Winchester Cooperative Theater), and at the university level (Harvard Libraries, Bunker Hill CC, and formerly at Northeastern and UMass). She was the Assistant Director for the Grammy Award-winning San Francisco Symphony Chorus from 1995-2003, under Vance George. with cathedral practice (rather than “mixed”). with the male alto placed between the two female altos.